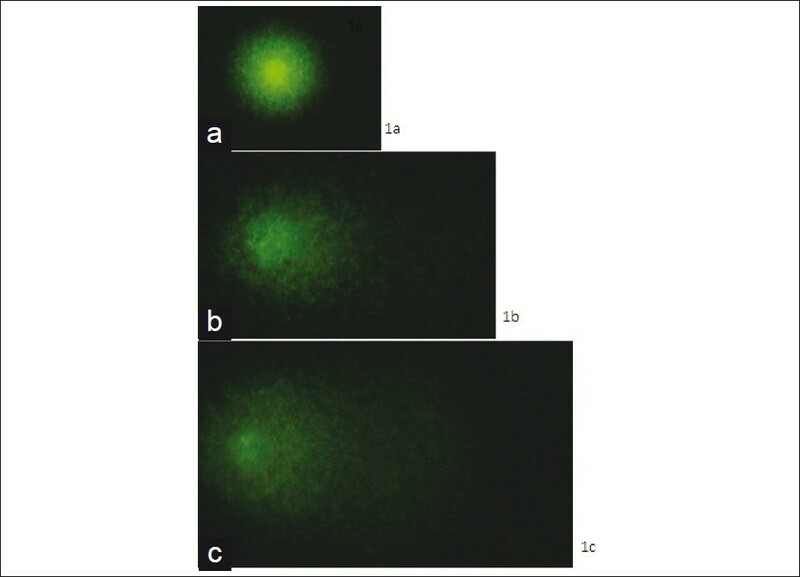 Ionizing radiation is a potent inducer of DNA damage and comet assay provides a very sensitive method for detecting strand breaks and measuring repair kinetics in single cells. The DNA repair capability influence cell sensitivity to ionizing radiation and predicting radio sensitivity of a cell population is very important for radiation therapy. In the present study the effect of gamma radiation on inducing DNA damage in two cell lines, normal human keratinocytes (HaCaT) and human tumor adenocarcinoma (HT 29) has been analyzed. Radiation treatment has been carried out using gamma radiation from a 60 Co source and the induction and repair of DNA strand breaks were quantified using alkaline comet assay. Repair studies were performed by incubating the sample at 37 0 C for different recovery times with the aim of elucidating repair kinetics. The relation between initial DNA strand breaks and the rejoining kinetics of the strand breaks has been studied in the present investigation. The average repair half time for both the cell lines has been found out. Heterogeneity in DNA damage within the cell population was observed as a function of radiation dose and repair time. It is observed that a comparatively radio resistant tumor cell line HT 29 has a shorter repair half time compared to that of normal cell HaCaT. Both the cell lines showed a dose-dependent repair activity and it indicates that the repair rate is proportional to the induced damage. 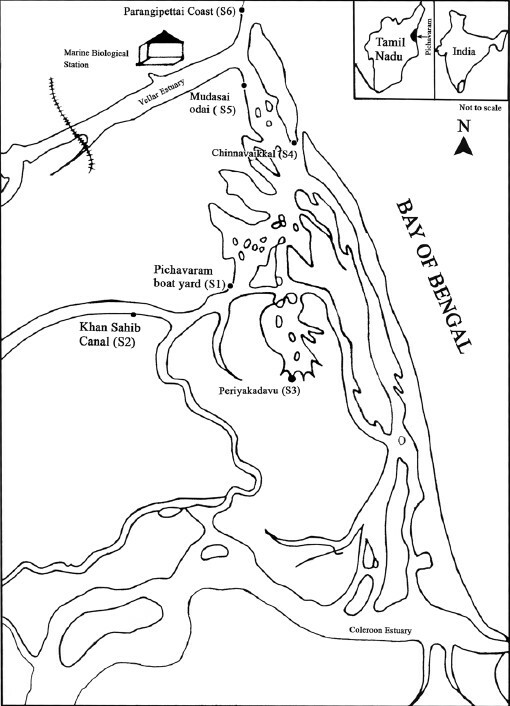 The paper reports the impact of the December 26, 2004 Sumatra Tsunami on the radioactivity profile in the environment of Pichavaram Mangroves (South East Coast of India) and bioaccumulation of two toxic radionuclides 210 Po and 210 Pb in seafood organisms and possible dose transfer to local fisherman population through seafood intake. The present study (Post-Tsunami) recorded low levels in all radiological parameters analyzed with respect to primordials in sediments and 210 Po and 210 Pb in water, sediment, and seafood organisms as compared with the Pre-Tsunami data. The mean activity of 238 U and 232 Th recorded in the present study were 12.2 Bq/kg and 11.7 Bq/kg, respectively. The activity of 210 Po in water was less (1.4 mBq/l) than that of 210 Pb (2.7 mBq/l). In contrast, the activity of 210 Po in sediment was distinctly higher (3.3 Bq/kg) than that of 210 Pb (1.7 Bq/kg). The shell fishes (Prawn, Crab, Bivalves, and Squid) accumulated more 210 Po (16.4 Bq/kg) and 210 Pb (2.7 Bq/kg) than the fin fishes ( 210 Po: 6.9 Bq/kg; 210 Pb: 1.5 Bq/kg). The results indicated that fin fishes as seafood were relatively less radioactive compared with shell fishes. About 90% Committed Effective Dose Equivalent to fisherman population due to seafood intake was from 210 Po (712 μSv/y) and 10% from 210 Pb (78 μSv/y). The higher dose transfer to Pichavaram fisherman was attributed to relatively more seafood consumption. 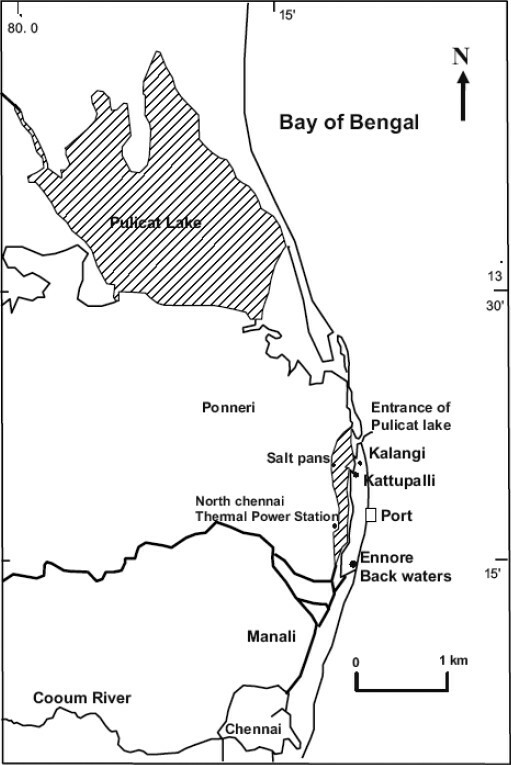 A low-level background radiation in the Post-Tsunami environment of Pichavaram Mangroves was due to the hydrodynamics of the Tsunami waves which removed the Pichavaram sediments loaded with monazites and other particles containing radionuclides. 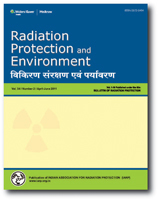 Atmosphere is an important pathway to be considered in assessment of the environmental impact of radioactivity releases from nuclear facilities. Estimation of concentration of released effluents in air and possible ground contamination needs an understanding of relevant atmospheric dispersion. This article describes the meteorological characteristics of Narora Atomic Power Station (NAPS) site by using the integral parameters developed by Allwine and Whiteman. Meteorological data measured during the period 2006-2010 were analyzed. The integral quantities related to the occurrence of stagnation, recirculation, and ventilation characteristics were studied for NAPS site to assess the dilution potential of the atmosphere. Wind run and recirculation factors were calculated for a 24-h transport time using 5 years of hourly surface measurements of wind speed and direction. The occurrence of stagnation, recirculation, and ventilation characteristics during 2006-2010 at NAPS site is observed to be 33.8% of the time, 19.5% of the time, and 34.7% of the time, respectively. The presence of strong winds with predominant wind direction NW and WNW during winter and summer seasons leads to higher ventilation (48.1% and 44.3%) and recirculation (32.6% of the summer season). 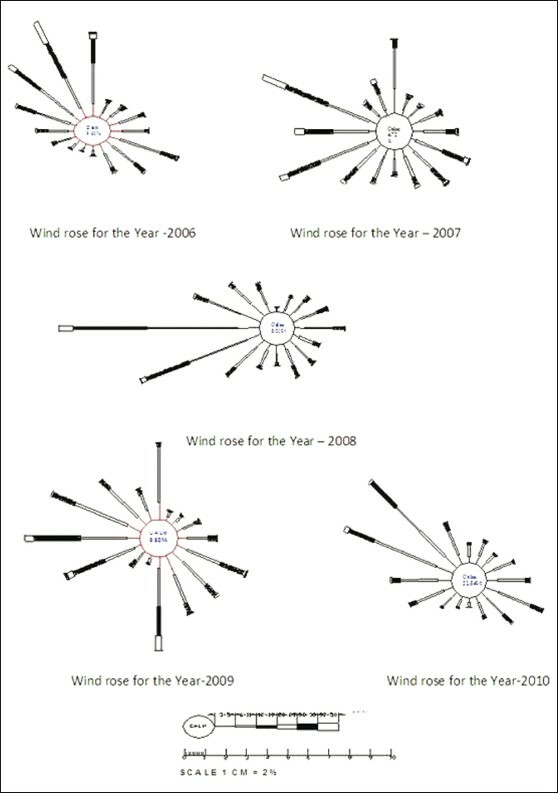 The presence of light winds and more dispersed winds during prewinter season with predominant wind directions W and WNW results in more stagnation (59.7% of the prewinter season). Thus, this study will serve as an essential meteorological tool to understand the transport mechanism of atmospheric radioactive effluent releases from any nuclear industry. The activity concentration of 210 Po and 210 Pb were determined in the edible muscle tissues of 20 fish species collected from Pulicat Lagoon, south east of India. The concentrations were found to vary between 38.3 Bq.kg - - 109.3 Bq.kg - and 0.72 Bq.kg - - 2.7 Bq.kg - for  Po and  Pb respectively. These variations in the  Po and  Pb content in different species were probably due to differences in metabolism and feeding patterns. Appropriate conversion factors were used to derive the committed effective dose for human consumers, which were found to be 73.3 1 - 209.1 μSv.yr -1 and 2.2 - 19.3 μSv.yr -1 for 210 Po and 210 Pb respectively. The radiation exposure through medical diagnostic applications has one of the significant impact on human health in addition to other natural radiations. Most of the medical decisions are dependent on X-ray diagnosis. Although the patient is benefited by these X-ray procedures, knowledge of the radiation dose received by the patient during these radiological examinations is necessary. According to the International Commission on Radiological Protection recommendations all medical exposures should be subjected to the radiation safety principles of justification and optimization. Similarly International Atomic Energy Agency also recommended that the guidance levels for medical exposures shall be established for the use by medical practitioners and relevant professional bodies. Therefore, several studies have been carried out all over the world to establish proper guidance levels as well as made efforts in the reduction of unnecessary exposures. In this study, the survey of population exposed to medical X-ray diagnostics in the Sindhudurg district of Maharashtra, India has been carried out. For this study questionnaire was developed and used for the collection of data directly from the people as well as from diagnostic centres. 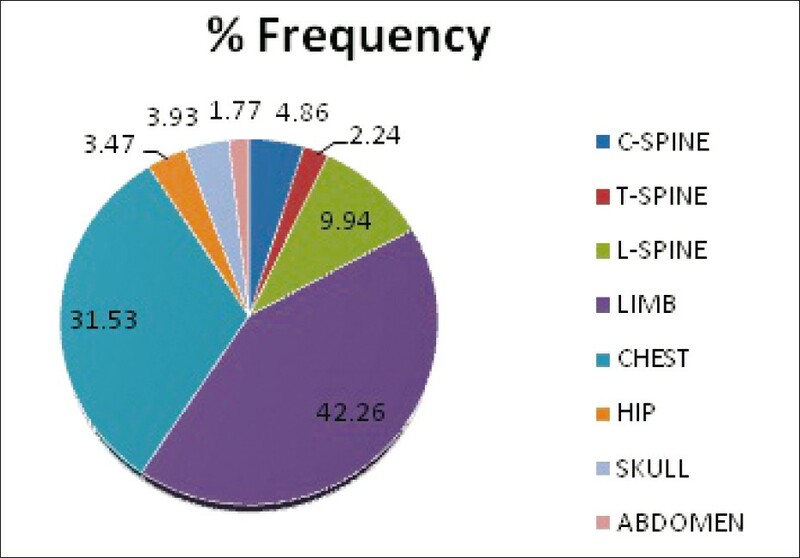 The collected data was sorted according to type of examination, age and gender of the patient and presented here. Using this data collective effective dose and annual per caput effective dose for the Sindhudurg district were calculated. From the study it is concluded that the calculated effective dose per person per year for the region is of the order of 0.061 mSv that is lower than the average value across the global population that is of the order of 0.62 mSv as given in the UNSCEAR 2008 report. The naturally occurring radioactive materials associated with quartzite rock samples used in the raw form or as aggregates in building materials from different geological locations have been studied using gamma spectrometry. The activity concentration of 226 Ra, 232 Th, and 40 K ranged from 27.64 to 225.78 Bq/kg for 226 Ra, from 20.08 to 72.07 Bq/kg for 232 Th, and from 118.09 to 1443.76 Bq/kg for 40 K. The highest values of 226 Ra and 232 Th occurred in gneiss quartzite from Twin Quarry (TQ), Shai Hills, while the lowest values of 226 Ra and 232 Th were recorded in gneiss quartzite from Rockshell International Quarry (RIQ), Shai Hills. 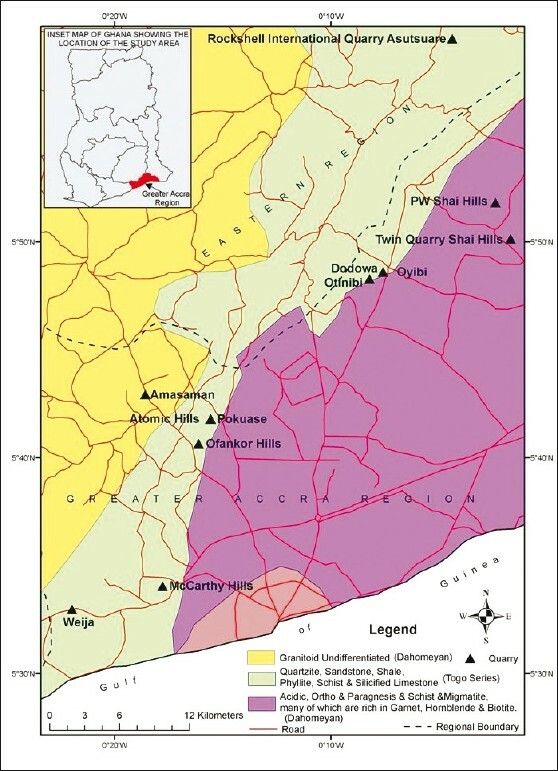 The activity concentration of 40 K varied from 118.09 to 1443.76 Bq/kg, with the highest value in gneiss quartzite from Twin Quarry, Shai Hills, while the lowest activity concentration of 40 K resulting in the micaceous quartzite was recorded from Atomic Hills. The radium equivalent activity (Ra eq ; 98.82-414.35 Bq/kg), the external hazard index (H ex ; (0.27-1.12), gamma activity concentration index (I g ; 0.28-1.48), the absorbed dose rate D in air (11.35-47.72 nGy/h), and the annual effective dose (E T ) (0.08-0.23 mSv/y) were evaluated to assess the radiation hazard to people living in dwellings made of these building materials. The results obtained were found to be within the acceptable limits for public exposure control recommended by the European Commission, International Commission on Radiological Protection (ICRP), and Organization for Economic Cooperation and Development-Nuclear Energy Agency (NEA-OECD). The research work was carried out with an aim to determine the radiological threat to the inhabitants of Chittagong city in Bangladesh. 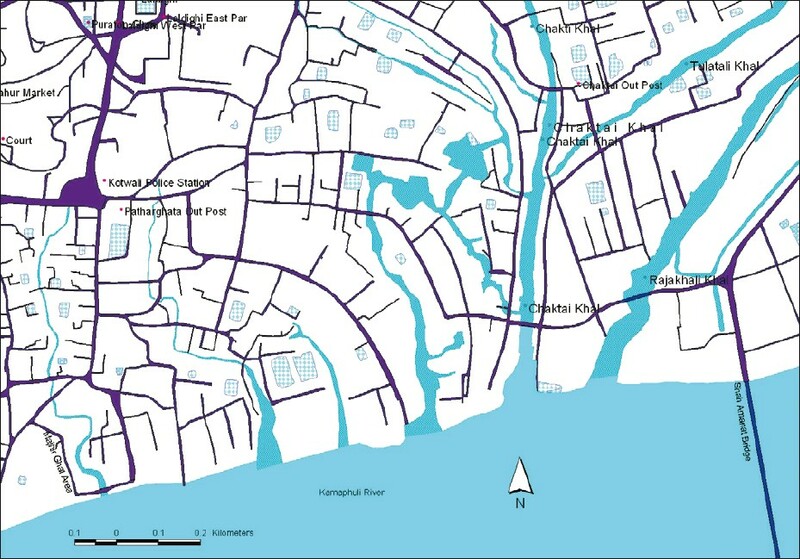 To investigate the radiological threat, the activity concentrations of naturally occurring radionuclides 238 U, 232 Th, 226 Ra, and 40 K were measured in the sediment samples collected from three locations of the major drainages (Chaktai Khal and Karnaphuli River) of Chittagong city. The activity concentrations of all the elements were found to be higher than those of the world average values. In the samples studied, the artificial radionuclide 137 Cs has not been detected. The radiation doses from where the samples were collected were measured directly by employing beta-gamma survey meter (model: LUDLUM 44-9). The average values of the radiological parameters calculated from the activity concentrations of the radionuclides mentioned in the sediment samples were found to be higher than those of the corresponding world average values. The results of the present research were compared with the corresponding results obtained in other locations of Bangladesh as well as in different countries published in different journals. 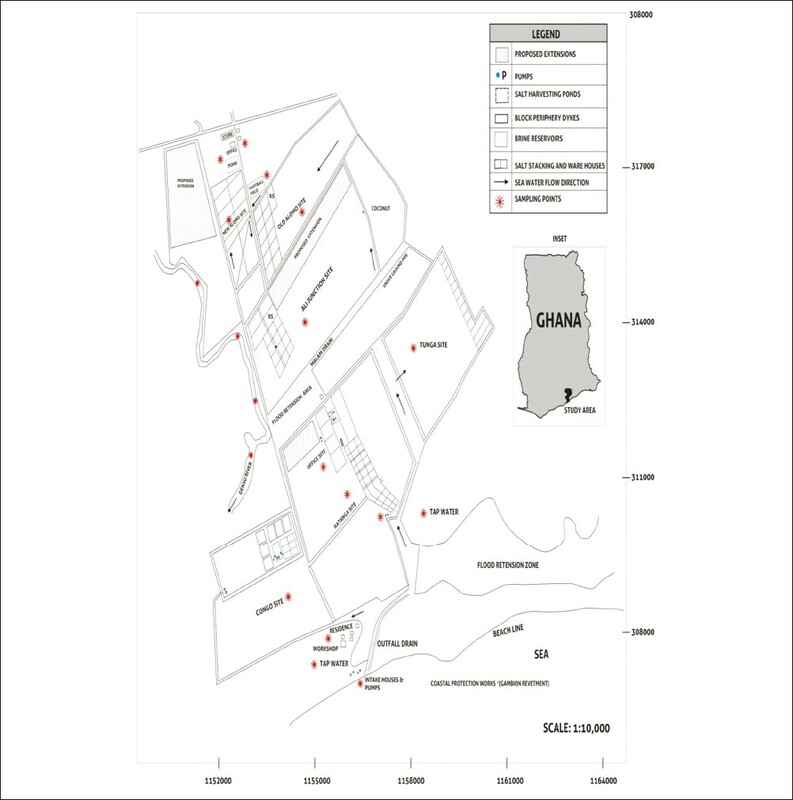 This study was conducted to assess occupational and public exposures due to natural radioactivity from 238 U, 232 Th, and 40 K in saline soil at Panbros Salt Industry Limited in the Greater Accra Region of Ghana. Activity concentrations in samples were measured using gamma spectrometry. The average annual effective dose in an outdoor environment for an individual worker was estimated to be 0.06 mSv/year, and for a member of the public, it was estimated to be 0.05 mSv/year. These values are below the average effective dose of 0.07 mSv/year received per caput worldwide due to external terrestrial radiation outdoors, given in UNSCEAR 2000 report. The results indicate insignificant contamination of the salt mining environment, and hence the workers and the public are not exposed to any significant radiological health hazard.